Do you live in the Brussels-Capital Region? Perhaps you work here or maybe you’re visiting? 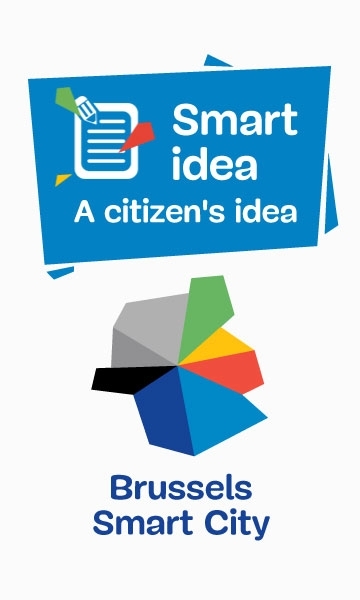 Smartcity.brussels would like to invite you to contribute to the citizens’ ideas box. You can submit your suggestions on how to develop a smart city within our region. 2What is the theme of your idea? If you live elsewhere, how often do you visit the Brussels-Capital Region? By clicking on "Send" at the bottom of this form, you authorise the collection and processing of the personal information you provide. Your idea will be submitted for assessment by the moderators of smartcity.brussels. Your idea may be rejected without any justification from them. Ideas including content which is offensive, unlawful, illegal, defamatory, denigrating, discriminatory, commercial and/or which constitutes advertising will not be considered. and, potentially, a brief outline of your suggestion and/or a title, adapted to the voting system for the website’s visitors. This online portal’s processing of personal data is subject to Belgian law (Act of 8 December 1992 on the protection of privacy with regard to the processing of personal data, as amended by the Act of 11 December 1998, enacting Directive 95/46/EC of 24 October 1995 of the European Parliament and the Council on the protection of individuals with regard to the processing of personal data and on the free movement of such data). Discover the suggestions in the smartcity.brussels visitors’ ideas box and vote for your favourite ideas! It is already being proposed for the E411 motorway. Install terminals with self-service electric scooters to facilitate mobility in the city (at reasonable prices of course). ?After having equipped the metro and pre-metro stations, equipping the region’s overground train stations with wifi would also be useful for citizens. By this way they can check traffic, the weather conditions or simply check random but basic corners of the city. Offer streaming of municipal council meetings on commune websites.